This is the second book by Claire Douglas that I’ve read – the first was her third novel, Last Seen Alive, which I thought was excellent (you can see my review here). 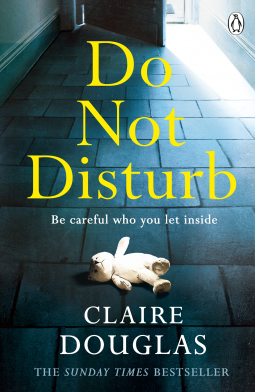 So I was keen to read her latest novel Do Not Disturb – I wasn’t disappointed! Kirsty, husband, Adrian and their two daughters, Amelia aged 11 and Evie aged 6, together with Kirsty’s mum, Carol have just moved to a house in a little village in the Brecon Beacons in Wales. The house, a big double-fronted Victorian house with pointed roof gables and arched windows, had been empty for several years and they have renovated it to run it as a guesthouse. It had been their dream for years and when the opportunity arose to move away from the frantic pace of life in London it seemed the ideal fresh start, particularly as Adrian had just recovered from a breakdown and had left his job in order to write. The book opens as Kirsty is woken by shrill screams and finds her mother crouched over a body. It then moves back to the events leading up to this scene beginning two months earlier as they work on getting the guesthouse ready. Amelia isn’t too happy at the move and thinks the house is jinxed and Evie has started to walk in her sleep. Kirsty and Carol have a tense, awkward relationship and Adrian seems detached from the rest of the family. The locals are unfriendly and hostile to the family, regarding them as outsiders, even though Kirsty is Welsh, and there are tales that the house is haunted. This is a novel with many family secrets that only gradually come to light and right from the start things go wrong beginning with the arrival of the first guests. Amongst them are Selena, Kirsty’s cousin and her little daughter, Ruby, a skinny, disabled child in a wheelchair. Selena and Kirsty fell out seventeen years ago after a major row and haven’t met since then. Kirsty’s brother Nathan and his wife Julia arrive and they too are having problems. Dead flowers arrive on the front doorstep. Evie says she’s seen a ghost, and that things have been moved in her bedroom, Kirsty worries that Adrian is heading for another breakdown and when a man from their past turns up things go from bad to worse. Kirsty can’t work out who she can trust or believe and I began to think that maybe I couldn’t trust Kirsty either. I really enjoyed reading this book. It is full of atmosphere, from the brooding Welsh mountains, their tops hidden in the clouds, the cold and rain, the almost Gothic house – was it really haunted? – to the moods of the characters and their tangled and unsatisfactory relationships with their secrets and lies. It looks at the nature and role of parenthood, of mother/daughter and husband/wife relationships and questions how far you would go to protect your loved ones. It’s a book that kept me guessing for most of the way. The ending, which I had guessed, after discounting most of the suspects, left me feeling quite unsettled, leaving several situations that could easily go wrong. It certainly gave me food for thought. Many thanks to Michael Joseph – Penguin Books and NetGalley for a review copy. Oh, Margaret, this sounds absolutely full of atmosphere! And that house! I like the setting, too. And I do like books where past impacts present, and secrets come out. I may have to look into this one – it sounds very tempting! I do like the sound of this one. Give me a creepy house and family secrets and I’m so intrigued. I’m going to watch for this one for sure. Thanks, Margaret!